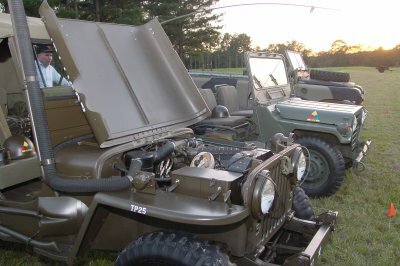 On the left is of course FrankenjeepTM and on the right is the 1941 Willys slatgrill owned by Richard Grace. Richard is a great guy. When I pulled up, he asked me if I was Bob N and if that jeep was Frankie the FrankenjeepTM. 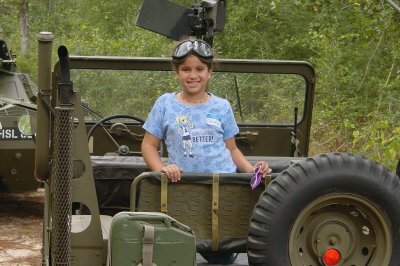 My wife, daughter and I attended our first MVPA Dixie Chapter Rally at Samson, AL. Held October 18 – 20, 2002. It is only the second MVPA related event I have ever been to. The first for the family. It was hosted by Lamar and Jewell Rowland of Just Loafin’ RV campground. The Rowlands put out a great event complete with food, trail run and swap meet. Friday night was fried chicken. Saturday morning was muffins and coffee followed by hotdogs and fixin’s for lunch. After lunch was a two hour trail ride. Dinner was spaghetti, garlic bread and more fixin’s. Followed up by breakfast Sunday morning. Richard Grace and I think, Jeff Smith were the two primary vendors at the show. And of course others brought some stuff to sell or trade. 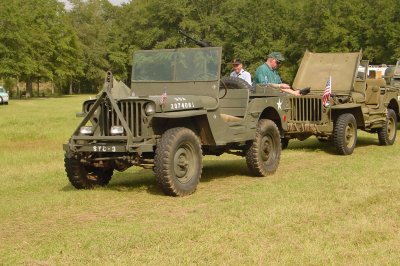 Richard had copies of the “Just Jeeps and Such” for sale. 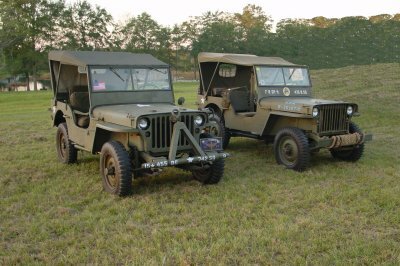 I purchased a copy along with a Sears jeep catalog (parts and PRICES to drool for, 1947 edition of the CJ2 owners manual and an Infantry Journal Outline on the war from 1939 to 1943. He also had some fire extinguishers, GPW battery trays and other interesting parts. It was a lot of fun to talk his ear off. 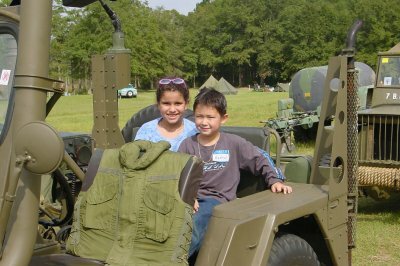 My daughter and her new friend Austin (grandson of Eddie and Lynn who brought a great Vietnam display, M151, at least one trailer, Mighty Might and had just bought a Duece to convert into a Vietnam era gun truck. There is Frankie in the line up about to go on its’ first trail run, estimated to be over 2 hours long. 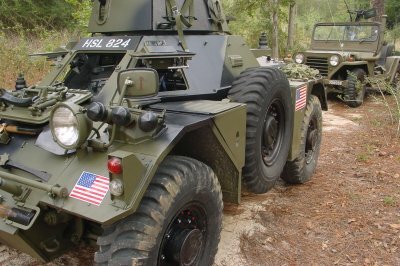 A few people spotted the brakes and no negatives for a change. I guess the NDTs help. 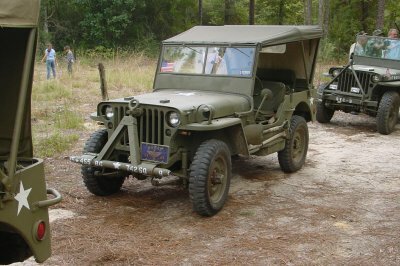 Richard describes this jeep as a driver. He has a first rate show winner at home but he wanted something he could take on the trail. My thoughts exactly. I followed Richard on the trail. 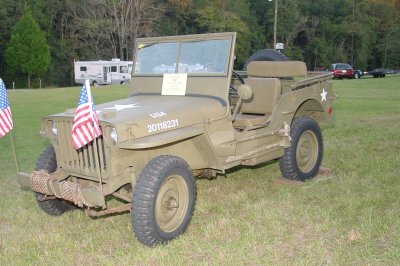 The owner of this jeep was quick to point out its’ weaknesses but still looking pretty good. The inner windshield had been replaced with what looks like plexiglass. Again Christina in the back of Eddies M-151 during a short break in the run. We had lost the last two vehicles at a fork in the trail. The last jeep went to go get them. So after a few minutes more run we stopped next to a deserted cemetery to wait for the stragglers. I’m really bad with names. But the owners’ name was Paul (I had thought Pat but my wife corrected me) of this pretty good looking 1942 Ford GPW Script. Rumor has it this jeep hit the creek too fast and died out. I wasn’t able to capture the event maybe someone else did. 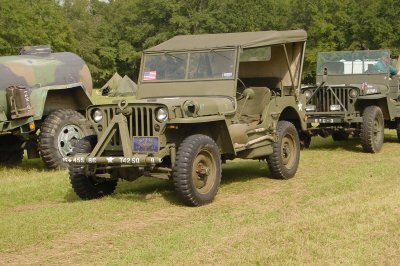 There was a pretty good mix of vehicles at the rally. 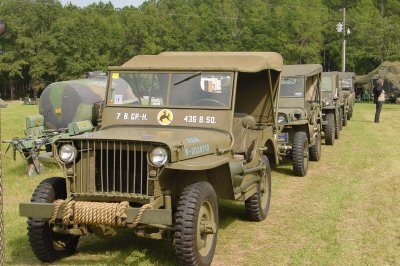 Three 2 1/2 tons, M37, two M38s, a Ferret, 2 GPWs (Script), 1941 Willys Slatgrill, Belgium 2 wheel drive Land Rover, a 109 LR, and some others I’m sure to have forgotten. 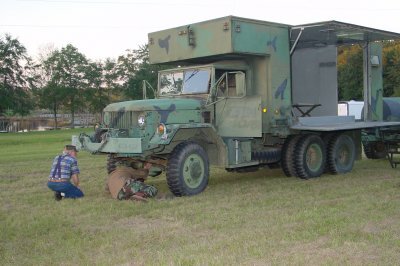 Lamar Rowland on the left and a prospective customer of a very nice 2 1/2 Water Purification Truck. The equipment for processing water is gone but you can see were it would make a heck of a camper! Fabricate some canvas walls and you got it better than a hotel. Lamar owns the Just Loafin’ Campground along with his wife, and Sugar Bear (the dog). Great couple. Why they even offered us the use of an extra mobile home that was vacant. We elected to experience the “cold” of Alabama. My daughter Christina had never been tent camping. Wiser minds prevailed the following night and we stayed in the mobile home. Oh, yes, if you are low on gas be sure to bring cash because the country store just up the road doesn’t accept American Express, or VISA or MasterCard for that manner. In this case–Cash, don’t leave home without it. This is Lamars’ famous Ferret. No as far as I know it was not involved in any interesting wartime action. Lamar has pictures of when it rolled on to its’ side blocking exit from the top hatch and the crane that was used to pick it up. He was unable to open the side “emergency” hatch. While they were stuck in the vehicle they were covered in gasoline and the motor was still running. Lamar was able to turn the engine off. Later he found evidence that the battery had arced but for the grace of God the vehicle didn’t explode into a ball of flame. His wife, Jewell, was able to climb out one of the view ports and then Lamar followed. Luckily no one was seriously hurt, not even the Ferret as it was used to lead the way on the days trail run. Well, if you have read this far, here is some more punishment. The following are some videos my wife shot during our 2 hour trail run. It’s nothing spectacular but considering the jeep made it, that’s something in and of itself!